Seems strange that they're only now naming it, has it deepened more than expected in the past few hours? The Irish met have been discussing the possibility of severe winds occurring Saturday all week. They placed an advisory a couple of days ago and today it seems to have upgraded. 80mph gusts over the South and East of Ireland during daylight hours and early evening . Like Britain it's the north and west of Ireland that usually sees the storms so it could be quite potent given all the circumstances. Hirlam FMI guidance now indicating potential for severe wind gusts into much of southeast Ireland this afternoon, thinking that Ireland's orange alert may be upgraded to red alert status if this guidance looks to be more accurate by 1100h. The difference is that a more circular low forms and moves well inland, in comparison to a rather glancing inland trajectory of an elongated trough on other models, albeit with quite strong wind gusts anyway. Something a little more organized and moving that far inland could bring in the very strong winds expected off the south coast of Ireland. Coastal Wales is certain to see some gusts over 120 km/hr by late afternoon also, Lancs by 8 p.m. Updated to slightly delay the start time until 1300 Saturday when the more widespread freezing rain will arrive. Some isolated pockets of freezing rain are possible before this and are covered by the snow & ice warning. Heavy freezing rain is expected to develop during Saturday. This will result in the rapid formation of widespread ice on roads, pavements, trees and other structures. Freezing rain is rare in the United Kingdom but when it does occur the impacts can be very severe. This is due to the fact that it can form very quickly, it can be difficult to see and is incredibly slippery. Some sleet and snow is possible over the very highest ground and the freezing rain may also be followed by a spell of sleet and snow as the precipitation clears from the west. The freezing rain and sleet and snow will be accompanied by strong southeasterly winds which will pose an additional hazard to travel, in particular over high ground. New weather warning for Southern Scotland and it is for the worst combination that can happen, Snow after Freezing Rain. Following freezing rain a period of prolonged, and at times heavy, snow is expected to develop later Saturday afternoon, then clearing from the west early on Sunday morning. 5-10 cm of snow is likely above 100 m but with strong south-easterly winds this is likely to drift as well as bringing temporary blizzard conditions. Well bit of a bust some freezing rain but not really heavy. Luckily the ice isn't widespread. Snow seems to be completely lacking from reports from members. To calm to call a storm here but then we are sheltered from the south easterly wind and XC weather does show some strong gusts. It is sleeting here in Keighley. The pavements and roads are clear but our driveway is impassable without ice grippers due to the freezing rain. Far colder than Limousin but Mylo loved the ice this morning! Storm force SE winds NE Scotland well there was 55 gusting 70mph just updated and look whats coming south of Ireland. Internet back now so I can post again! 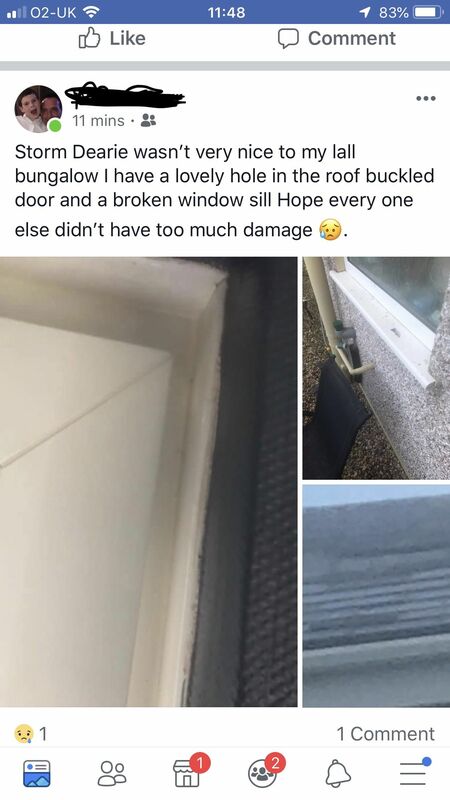 One of my friends who lives In Whitehaven been left with a mess from Deirdre overnight although he called it dearie lol he’s got a buckled door, broken window and quite a few slates have blown off. The nearest station St Bees a few miles down the coast from here recorded gusts on the hourly obvs of 72mph @ 00:00 and 76mph @ 01:00am.